Despite its small requird space of just approx. 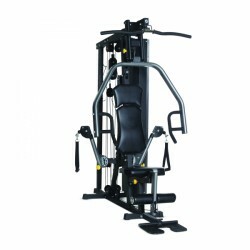 2 squer metres, the Horizon multi-gym Torus 1 offers a complete whole body training. Five exercising modules offer sufficient possibilities to do a diversified training. Delivery: ok Quality: could be better, looks rather cheap and rollers do not turn smoothly. The frame is very stable. Equipment: large variety of exercises, however pls. note accessories mentioned on the producer’s web page http://world.horizonfitness.com/product/torus-3-home-gym are not included!!! Recommendation: good (not excellent) multigame for the price!!! Delivery: ok Quality: could be better, looks rather cheap and rollers do not turn smoothly. The frame is very stable. Equipment: large variety of exercises, however pls. 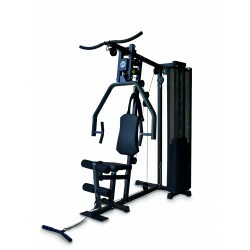 note accessories mentioned on the producer’s web page http://world.horizonfitness.com/product/torus-3-home-gym are not included!!! Recommendation: good (not excellent) multi-gym for the price!!! Horizon Fitness multi-gyms Torus offer you numberless exercising possibilities and high quality for maximum individuality and creativity in the course of exercise. Due to the small set-up space, Horizon home gyms only require small space and can be perfectly integrated in your private fitness gym at home. The weight stacks of a Horizon multi-gym can be optimally adapted to the individual training progress of the user. In order to benefit from a Horizon home gym for a long time, it was mainly focussed on the fact to allow enough reserves for increase in weight and training intensity throughout the development. 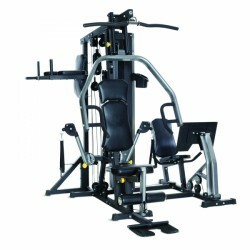 The multi-gyms of Horizon Fitness offer their users a wide range of strength training. It includes lat pull sessions for strengthening back and neck muscles to workouts with the leg curl for strengthening the thigh and calves. Exercises which are guided or set are especially ideal for strength training newcomers. Thus a wrong course of motion is prevented. Free exercises, like those done on a weight bench, have an increased demand on coordinative skills of the user and thus should only be done by persons with enough experience. Due to their innovative cable pull systems, Horizon multi-gyms offer, among other things, several possibilities to switch from free to guided sessions throughout the workout and thus strengthen muscles and coordination more varied and more complex. 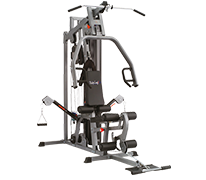 Multi-gyms like the Horizon Torus 5 allow the integration of additional elements like a dip module or a leg press in order to extend the workout easily and to set new training stimuli. Last but not least, the high demand of Horizon on multi-functional use of its home gyms is presented by the Horizon multi-gym Torus 3 with a total of 6 integrated training modules. A stable workmanship of upholsteries, joints, and frame are very important for a perfect training with a multi-gym. The frame of the Horizon multi-gym Torus 5 is made of steel tubes, which are galvanized and powder coated to ensure an excellent stability. Horizon multi-gyms provide high comfort by their several adjusting options of backrest and sitting upholstery as well to adapt ideally to the individual measurements of the user. It's the same for their material workmanship, which allow a comfortable workout even for frequent use. For an even weight load while doing multi-gym training, Horizon relies on high-quality ball bearings of its pulleys. Lower cable pull for an effective biceps and triceps training in standing position.